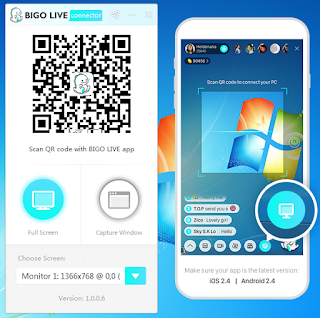 Andiez Tutorial - Bigo kembali mengeluarkan update terbaru yaitu versi 2.0.0.3 yang pasti nya pada update terbaru yaitu memperbaiki beberapa bug, Jika sebelumnya anda bermasalah saat login BigoLiveConnector karena tidak bisa tampil Scan QR Code Di PC dengan adanya update terbaru Versi 2.0.0.3 sekarang sudah bisa tampil Scan QR Code Di PC tanpa harus menggunakan aplikasi VPN, Silahkan di Download gan. 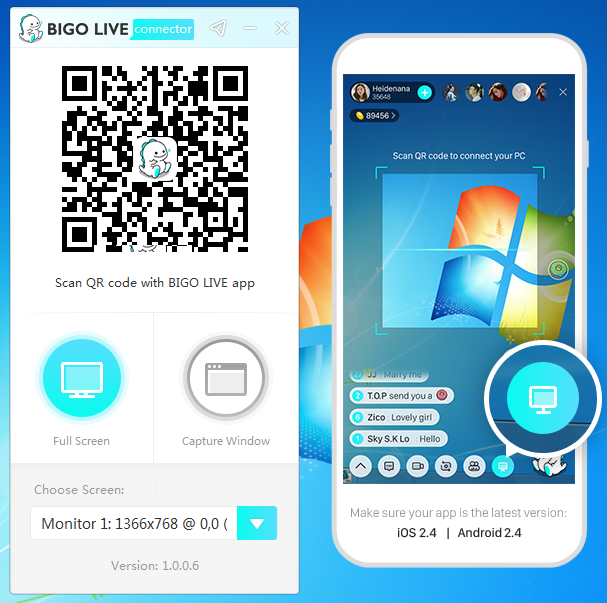 Now you can add the camera, image and text into the LIVE screen. Can easily switch the capture mode during the LIVE time. Resolve the delay caused by the preview function. Improved experience and fixed bugs. View the comments when you are in the game! Can directely reply to the audience on PC. Can view who is in your room now. Change the LIVE title at any time. - Optimize the match accuracy of game tags. - We now support more languages, eg: Vietnamese, Indonesian, Thai, Korean, and Russian. - Now you can find‘Pin the toolbar on top’ function from the Settings. - Optimized gaming graphic quality. - Improved experience and fixed bugs. - Added game detection and automatic labeling function. - The display of LIVE Statistics on PC connector is now available. - Optimized Mic switching between the phone and the computer. - Replaced the donuts with LIKEs! - Optimized the pop-up window. - Fixed a compatibility problem, which may cause failure in live streaming. - Adjusted UI, eg: replaced "window capture" mode with "game capture" mode.